Andrew Goff / Thursday, May 2, 2013 @ 9:13 a.m. / Flatmo'd! Local artist/celebrity/life-liver Duane Flatmo likes beer. And sometimes when he drinks it his mind wanders. Often then his hand starts a-scribblin’ and the world gets a glimpse into one of Humboldt’s great noggins. 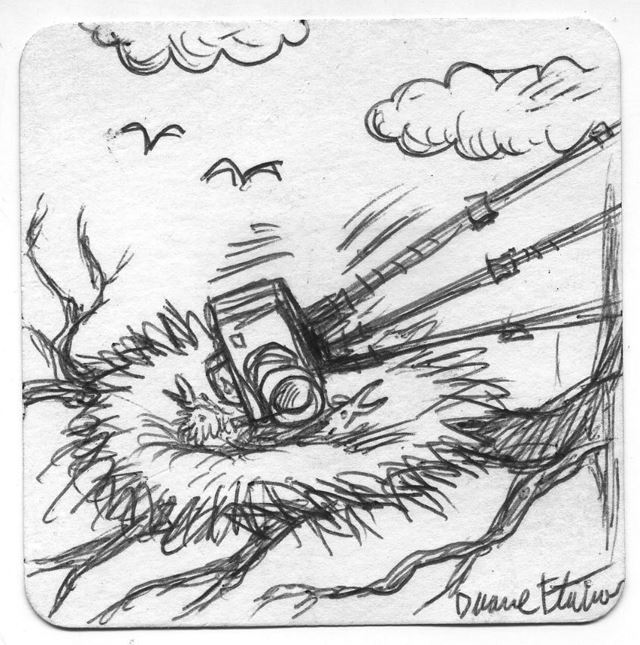 In the first of what we at the LoCO is hoping will be a regular coaster art feature, Duane ponders what would happen if the wind maybe blew Eaglecam just a little too hard. Poor eaglets!